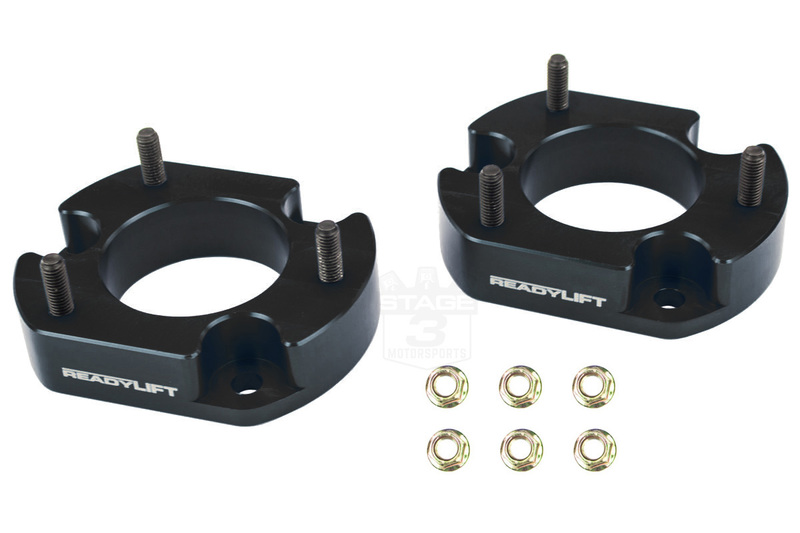 If you're looking for a high-quality and extremely tough F150 leveling kit with a little more style than the usual crowd, then this Ready Lift Billet 2" Leveling kit is just what you need. 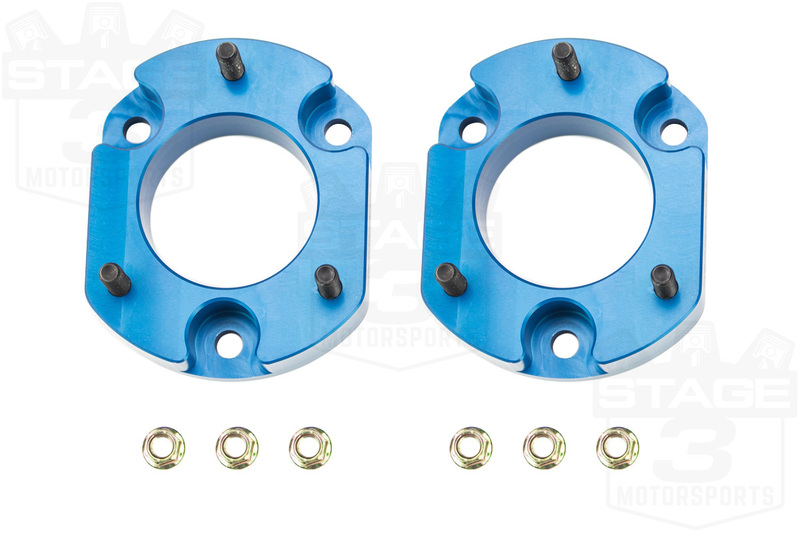 This kit features two strut mount spacers that easily install onto your truck using their supplied hardware. These durable spacers add 2" of ride height onto the front of your 2004 to 2014 F150 which eliminates the truck's frontal rake and allows you to fit on up to 33" tires to help give your truck a rugged, off-road look. The high strength of these spacers blows most other kits out of the water and allow you to take your truck just about anywhere you dare. Both of the spacers included in Ready Lift's F150 leveling kit are made out of CNC machined 6061-T6 billet aluminum that makes them much stronger than stamped or welded leveling systems. 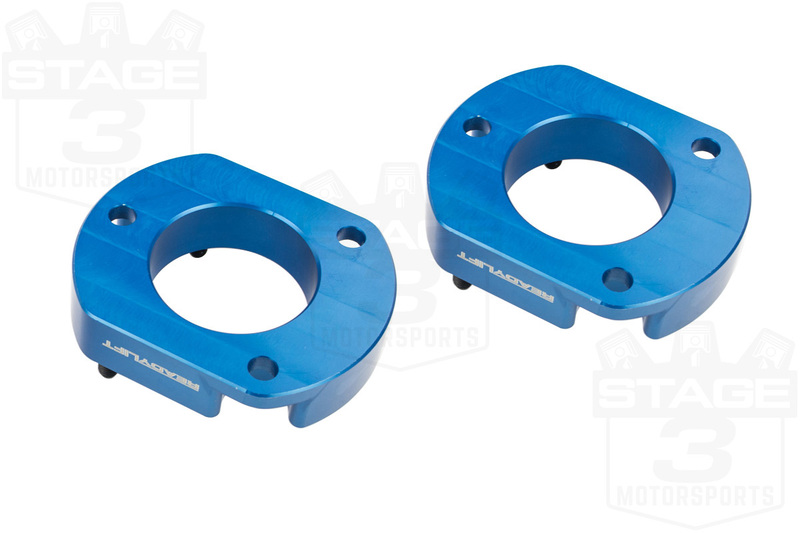 Each spacer comes in your choice of blue, black, red, or silver anodized finishes that protects against corrosion. 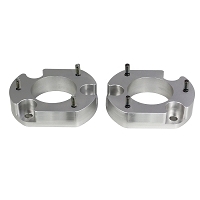 Ready Lift's spacers are easily installed on top of your F150's struts without the need for any cutting, drilling, or other permanent modifications. Ready Lift even backs their leveling kit with a Limited Lifetime Warranty for even more confidence. 2014 F150 Install Note: this spacer kit requires the removal of your F150's front struts for installation and may require clocking the upper strut mount for proper fitment. Please contact Stage 3 directly at 1-877-578-2433 with any questions or concerns. These are a great addition to any truck. The only two issues I had were that on the '13' the red anodizing doesn't show at all when installed and a slight revision to the instructions is necessary as getting the shock back into the mounts was nearly impossible whithout removing more parts. Added during a front end replacement. Easy to install with the UCA and LCA removed. Color doesn't matter; ford have a shroud around the top that completely incase the leveling block and top of the strut/shock. Quality feels great! I am not too familiar with the leveling kit. I like your 2007 FX4 project truck and I am trying to do something like it or to just wait and see what you do with the 2004 4x4 but I don't want 6', well the question is if I do level the front do I have to get the back to get a little bigger tires too? You can just do a 2" level on the front to get on up to 33" tires without doing anything to the rear. My local shop wants $200 to install these. How hard would it be for me to do it with hand tools ? Not overly difficult. Unlike some kits, you do not have to cut the stock strut studs. The only thing that is a total bear is the lower strut mount bolts on the LCAs. They take a lot of force to wrench out, and you may want to consider renting an impact wrench (unless you have one). 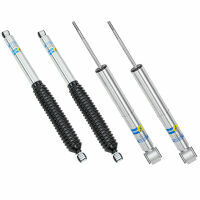 You'll probably also want a breaker bar or crow bar for lowering the upper control arm back down into the spindle. Other than that, it's very straightforward. Just make sure to get an alignment afterwards. With a 2" level up front and the rear staying stock, how will the level affect my mpg's? In general, a leveling kit will have either no effect or a very slight negative effect on fuel economy on its own. Nearly all of the fuel economy losses from leveling kits is from adding larger tires which increases rolling weight and rolling resistance which increases engine load. The additional ride on its own has a negligible effect. 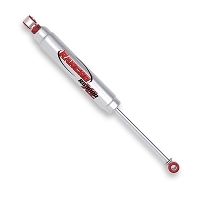 The Daystar Kit is quiet, but you may need to cut your factory strut studs for installation. 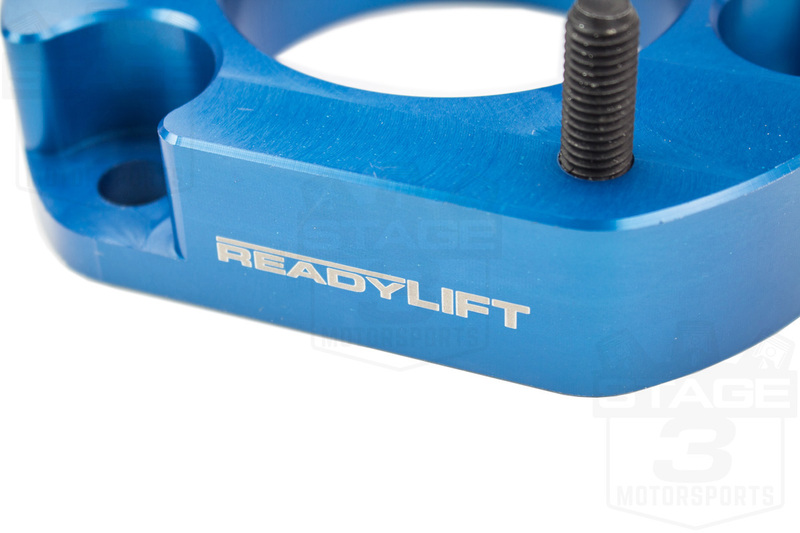 The ReadyLift kit is made of metal, so you can get a little extra suspension noise, however, you don't need to cut the stock studs, which makes installation easier and allows you to return your truck to it's factory rake when it comes time to sell it. Is this leveling kit compatible with ford's advancetrac traction control system on a 2015 f150 allowing for normal and proper operation? A leveling kit is not going to effect the operation of your F150's AdvanceTrac or traction control systems. How is the difference in ride? In general, there's not too big a change in ride quality. You may see a slight increase in overall NVH, and you may feel your UCAs come into contact with your coil spring if your suspension fully articulates or droops. with this 2'' and put a block in the rear would I be able to fix 35' tire with out damaging the tire ? Tire fitment is also going to depend on your wheels, though generally the maximum size tire you can fit without rubbing on a 2" leveling kit is a 33" tall tire. My 2008 F-150 4 wheel drive.. If I add a 2" front leveling kit and will be able to go to a 35" tire size, will I be able to use those tires on the same factory rims on my truck ? You will not be able to fit 35" tall tires on a 2004-2008 F150 with a 2" leveling kit without at trimming or risking pretty serious rub. How much you'll rub and how much trimming you'll need to do is going to be dependent on the width of the tire.